After scrolling through my blog posts I realised that I havent blogged about anything 'makeup' in ages. How can this be? Makeup is one of the loves of my life. I'm a self-proclaimed makeup aficionado and yet no ramblings about makeup? How blasphemous! So to atone for my sins against all things 'beauty', I shall ramble about my major Budget Makeup finds. Indulge me for a moment while the Bimbo in me rejoices. Now for those who knows me personally, they all know that I would never leave the house without mascara. Forget everything else. As long as I have my mascara on, I'm ready to take over the world! Greasy face and all. I have no clue why I prefer to have mascara on rather than covering up the oil rig that is my face, but I guess each to her own quirks, right? So after years of searching for the right 'budget' mascara (I still don't dare to hit the luxe beauty counters yet), I have finally found IT. THE mascara. The ONE that actually does as it says. I am in LOVE with this mascara. It is THE BEST counter brand mascara that I have ever worn. Who would've thought that a coincidental find during an impromptu outing would lead to this treasure. So what's great about it? Check out the before and after pictures. Not impressed yet? How about if I tell you that I did not use the eyelash curler at all. Now are you impressed? But what really sold me on this product is the fact that it volumises without making your eyelashes look clumpy. I have fine, long, razor straight lashes so I need mascaras that'll make lashes look fuller. The fact that Rosewood volumises without making it look like I was trying too hard was definitely a clincher for me. And the part where I can forget about curling my lashes before application was definitely a much appreciated bonus. 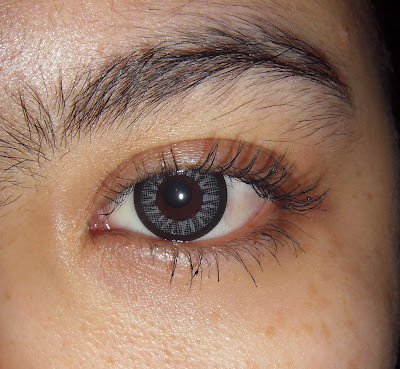 I've tried on the mascara on 5 seperate individual (including myself) and the results are the same each time. But alas, nothing is perfect. There are some cons with this product. Sometimes when you "glow" a little too profusely (remember girls only horses sweat and men perspire, we women "glow") the mascara flakes a little. Nothing major like finding black bits all over your face all of a sudden, but I would suggest that you lay off this mascara if you plan on doing heavy duty workouts. But for a normal day-to-day wear, this mascara is da' BOMB. And con #2 would be the fact that you cant get this product at just about anywhere. Major pharmaceutical chains like Guardian or Watsons don't carry this line so what you need to do is find this store: Yokoso Shiyuki. 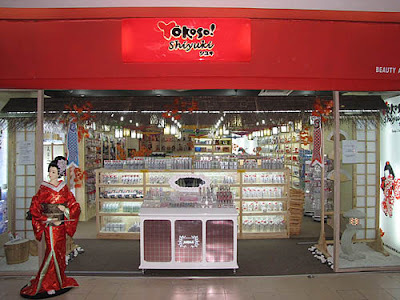 It is a Japanese concept store which has only 9 outlets in Semenanjung Malaysia. Since I am in KL, the only place that I can go to to get this product is either Sungei Wang Plaza, One Utama or Pavilion. It's a bit of a hassle yes, but it's worth it girls!! Plus it's only RM40. I've bought much more expensive crap from Lo'real and Maybelline and all the other more renowned counter brands but they all can't hold a candle against this one. If you need more info you can always check out the Yokoso Shiyuki website but I suggest you go to the stores direct since the website is looking a little minimal. I'm guessing the Japanese translating the website into English may have run off on them. But check out the pic of the store. Even if you don't buy anything from there you'd have loads of fun checking out all the cool Japanese items. There's more than just makeup and beauty stuff. As for the guys, you may want to go and check out all the pretty girls in kimonos acting all kawaii. There was a time when I thought that the makeup base was just the makeup company's ploy to get people to buy more of their products so I never actually felt the need to and try any. But after years of experimenting with different products and different ways of putting on makeup I realised that sometimes you do need a little extra "help" in ensuring that your makeup doesn't melt into a pool of goo. Most girls would be content by just putting on moisturisers before their makeup but for people like me who generates so much oil that I can put Petronas to shame, I cant rely on moisturisers too much. If not Petronas can come over and build an oil rig on my face. When Majolica Majorca hit the Malaysian shores, I was itching to try something. I mean what girl wouldn't? They had really cute casings, and cute names for the items that you just can't help but spend hours standing in front of the makeup display and trying on stuff. Hence my encounter with the 'Skin Lingerie'. And seriously, they kid you not when they call it skin lingerie. 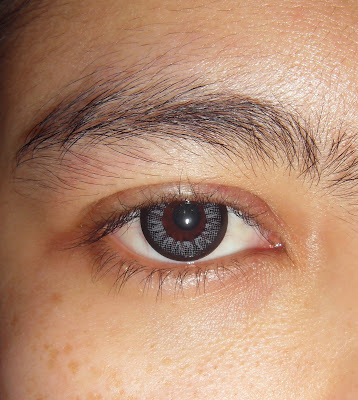 The gel-like substance actually makes your skin all smooth and soft after application. It has no smell, which I love, and sets almost immediately. Since it has OD control (oil/dry control) it's suitable for all skin types. I am in love with the fact that you don't have to use much to get a smooth even skin and also the fact that it actually really does control the oil secretion on my face. I hardly need to use facial blotters anymore. Woohoo! Sorry Petronas, I guess you need to find your oil supply elsewhere. And of course, since my face ain't so oily anymore touch ups don't happen that often anymore. Major time saver. Since this product is only about RM40, it'll definitely be a good substitute for all those pricey makeup bases from MAC or Bobbi Brown. But don't just take my word for it. Check out this review from Stephanie, another Majolica Majorca user. This is probably the best find out of the bunch. The best liquid foundation ever to be sold by any counter brands. One thing that I hate most about liquid foundations is the fact that for those that promises a matte finish dries too quickly upon application. As for the rest, it is either too runny that it does not offer any coverage whatsoever or too moisturising that you can actually fry an egg on your face within minutes after application. So yeah, it was for these reasons alone that I have decided to do without liquid foundations all these years. Plus, I hated the foundations stains on my tudung and shawls. Liquid foundations and I have never had a good relationship. The only reason why even have liquid foundations in the first place is because I sometimes help friends out with bridal makeup. I am a budget makeup artist, catering to those who prefer to not spend a ton on makeup as well as to those who keep their makeup light and simple hence my introduction to Rimmel. I needed liquid foundations which will stay put for long hours, require very minimal touch ups, will not transfer on clothings or tissue but at the same time will make the wearer look as natural as possible. And all this must be done within budget. Not an easy feat, I tell you. So after hours of internet research, major window shopping and product testing I decided to try out Rimmel. I was actually torn between Maybelline or Rimmel since they were going for around the same price (RM 35 -40 per tube) but Rimmel won out because the tube was much bigger. Yes, I can be a scrooge sometimes. But thank Rimmel for being generous, if not I probably would not have realised how heaven sent this product was. For the first time in my life I have actually found a liquid foundation that really does as it is advertised. It does stay on for 16 hours. It does make your skin look naturally dewy. And it is transfer resistant. Both the bride and I were absolutely happy with the outcome. Even the groom was happy with how she looked which to me is the best compliment a bridal makeup artist can get. Plus, I am overly ecstatic by just how many people that has actually complimented on how my skin looks after wearing this foundation. Even more so when I pair it with the Skin Lingerie because then my skin looks super smooth (please indulge my perasan moment :P). But again, don't just take my word for it. Check out the Rimmel London review page and you'll see that out of 10 users using the product, 9 gave the foundation glowing reviews. There's even one professional makeup artist saying that she's switching all her foundations to this brand since she's so happy with it. So yeah, those are all my major makeup finds so far. I can safely say that I'll be sticking with this 3 products for good. Unless I find something else that can top them. Or maybe when I can finally pluck up the courage to actually go up to those luxe makeup counters like MAC or Bobbi Brown and splurge like crazy. But I don't see that happening anytime soon *sigh*. But do try out these products and let me know what you think. kak shan, maybe i should give you my rimmel matte foundation (something like that) because it really doesn't suits me at all. it became all flaky and i look so horrible. don't want to let it go to waste, so perhaps you could do review on that too. hehe. p/s: definitely im going to check out that majorlica thingy! Shan thank you for the review. I am currently looking for any make up base and foundation that won't cost me a bomb..i don't want to splurge so much since I would only wear make up when necessary. Maybe you can teach me how to apply the stuff on my face. Saya adalah hopelsee when it comes to apllying make up..pakai ikut suka hati..woot woot! No problemo Zeti. Glad the review helped. I'm making it my lifetime mission to find affordable counter brand makeup so that it wont burn a hole in anyone's pockets. And let's set up a girly day together and we can put makeup on each other. Huhu~ FUN!